Bring handcrafted beauty to a hallway, bedroom, or living room near you with our Amish Bay Hill Mission Storage Bench. From the heart of Indiana Amish country to your home, you will be able to feel the dedication that our woodworkers put into every bench that they make by hand. 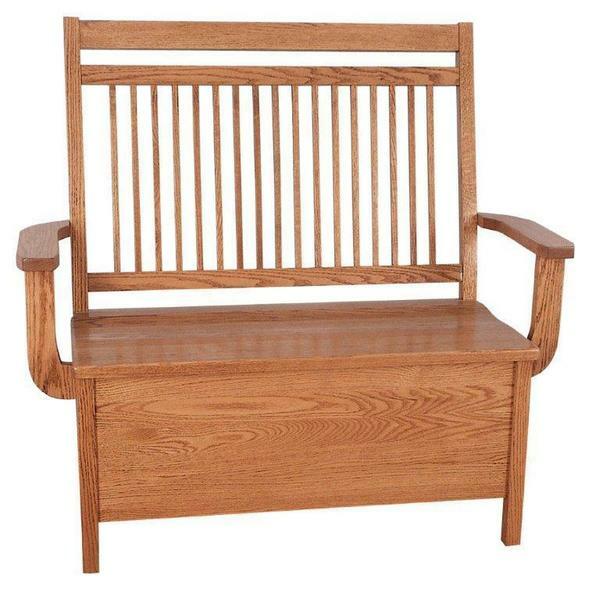 Customize your bench in our 8 varieties of solid hardwood as well as 6 rustic options. Create the bench you have always envisioned for your home. As standard, the Amish Bay Hill Mission Storage Bench features solid scoop seating that lifts up to a 6" or 12" storage. Complete with two soft close lip supports so you won't have to worry about fingers getting caught. Choose to add a cushion to the seat of your custom bench for even more comfort. Please feel free to give us a call with any questions you may have: 866-272-6773. We look forward to speaking with you! Stop by our Amish Furniture Store to take a closer look at our wide range of American made furniture. Seat Width: 38" or 48"